“Indivisible” is about the real people at the heart of our nation’s immigration debate. Renata, Evelyn, and Antonio were young children when their parents brought them to the U.S. in search of a better life; they were teenagers when their mothers, fathers, and siblings were deported. Today, they are known as Dreamers. 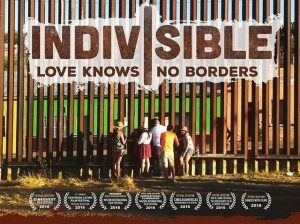 “Indivisible” takes place at a pivotal moment in their lives, as they fight for a pathway to citizenship and a chance to be reunited with their loved ones. Frustrated with the stalled legislative process, the trio take matters into their own hands and petition for a special waiver that would allow them to leave the U.S to visit their families—and legally return. With the future of immigration reform uncertain, the three do not know if their trips are a once in a lifetime experience, or the beginning of true family reunification. Doors Open: 6 pm for snacks and conversation. Stay for immigration speaker & audience discussion. Co-Sponsors: immigrant support organizations, Mt. Baker Community Club, So. Seattle Climate Action Network.